Airco Aircraft Charters Ltd. operates a fleet of all-weather, twin-engine aircraft that will take you to and from remote locations and major destinations in Canada and the United States. Conveniently headquartered at the Edmonton International Airport, our fleet includes Beechcraft 1900Ds or Beechcraft King Air 100s. If you’re looking for an aircraft charter in Edmonton or Calgary, contact us today to request a quote. 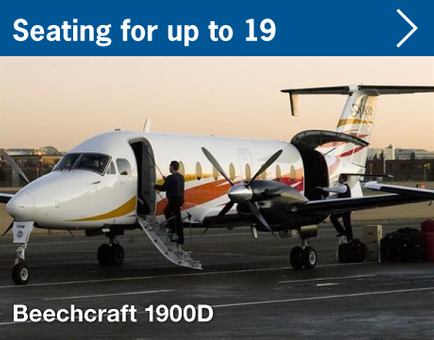 The Beechcraft 1900D is a roomy aircraft with a stand-up cabin that can accommodate up to 19 passengers quite comfortably. 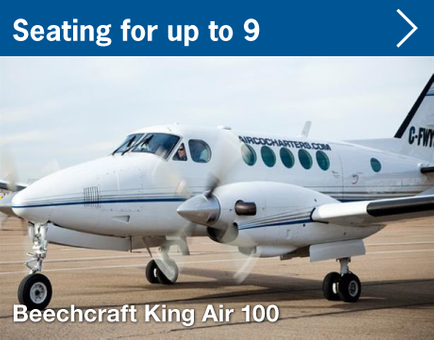 Like the 1900D, the King Air is pressurized but since it is smaller it is a practical choice for groups of up to 9 travellers. With multiple options and years of exceptional service, you will fly in style with Airco Aircraft Charters Ltd. Whether your trip is for business or pleasure, we look forward to making your next aircraft charter in Edmonton or Calgary an event to remember. Airco Aircraft Charters Ltd. offers safe, convenient and hassle-free aircraft charters to a wide variety of airports throughout Canada and Northwestern United States. Airco is based at the Edmonton International Airport; however, we can provide multiple departure points for your aircraft charter including Calgary International Airport, Grande Prairie Airport, Fort McMurray Airport or the Red Deer Airport as well as many other locations. Our reputation is built on nurturing strong relationships with our customers to ensure satisfaction. Many of our customers have been flying exclusively with us for decades. With so many incredible locations to explore in North America, we can help you take the path less travelled. Whether you are attending a meeting in a remote location or doing a group fly-in fishing trip, we’ll get you there. And if you need some important parts or cargo delivered on short notice, we’ve got that covered, too. Airco can provide charter services to most airports throughout British Columbia, Alberta, Saskatchewan, Manitoba, the Territories and many other areas. Imagine no more long line-ups or trying to navigate your way through crowded airports. We work around your schedule, rather than the other way around. As one of the leading aircraft charters in Edmonton, we offer cost-effective flights at your convenience 24 hours a day, seven days a week and 365 days a year. Airco can usually be ready for departure in approximately ninety minutes after confirming your flight. To learn more about, or request a quote, for your next aircraft charter from Edmonton or any of our other locations, contact us today to start planning the perfect flight for your next trip.